These delicious gluten-free bites are a light and healthy meal and a wonderful lunchbox alternative. Combine all ingredients except the chickpea flour and baking powder in the food processor and blend until chickpeas are just chopped but don’t pureed as it’s ideal to preserve some of texture. Add the baking powder and chickpea flour (1/4 cup only) and pulse to bring it all together into a dough. Add more flour or water if dough is too wet or dry and not holding together well. Form the dough into a large ball, cover, and refrigerate for about 30 minutes to an hour. Line a baking tray with baking paper. Form the mixture into 5 cm balls (approx. golf ball size). Place the balls onto the baking sheet, they don’t need much room between them since they don’t expand during cooking. Flatten a little with a fork if desired. Bake for 20-25 minutes, turning them over about halfway through, until browned. Serve the falafel on top of a fresh green salad with all of your favorite veggies (or try one of THESE recipes) and drizzle with this delicious Lemon Za’atar Tahini Dressing. 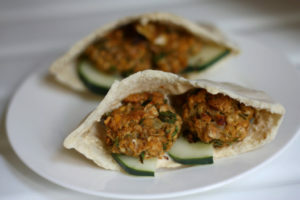 You could also serve them inside of a lettuce cup or pita pocket.